How Do I Figure Out My Notes' Accounting? Home›Real Estate Investing Basics›How Do I Figure Out My Notes’ Accounting? How Do I Figure Out My Notes’ Accounting? This has to be up there as one of the most commonly asked questions, especially from newer note buyers. So, why is it that so many people have this question? Perhaps it’s the fear of not being accurate and compliant. Or, maybe it’s just learning how to figure it out for the type of loan you just purchased. First of all, there can be a lot of accounting, period, when you’re in the note space. But, we’re mainly looking at the accounting for a note that’s provided by your note seller and the accounting needed for that note during your ownership, whether that involves starting legal action, creating a payoff for a homeowner, or selling your note. What info do you need from the note seller? Let’s first look at the accounting provided to you from the note seller. I’ve seen cases where we’ve received 42 pages of accounting information on one account and others where we’ve received just two pieces of data: the UPB (Unpaid Principal Balance) and the next due date. To be quite honest, I prefer the latter. Besides the actual note, these are the only two pieces of information necessary to figure out the accounting. For example, it’s pretty easy to figure out the number of late months once you know the next due date versus today’s date. If a loan was taken out 10 years ago, and they made seven years of payments, it doesn’t take long to figure out that they owe 36 months of missed payments, plus late fees, in addition to the UPB. Some folks decide to use a servicer as soon as they purchase a note. In that case, there’s less to worry about, not just in regards to licensing and compliance, but also for the accounting. It’s much like property management for a note. Others, especially those buying non-performing notes, might opt out of using a servicer until the note becomes performing again. In this situation, the accounting is pretty straightforward, as the UPB does not change when no payments are being received. Once a loan starts to perform again, the note owner is now on the hook to provide 1098 interest statements for years’ end to all borrowers. This service, along with many other à la carte services, including late notices, lost mitigation, loan modifications, etc., are also available. ACH setup and the servicer’s ability to plug in your work out agreement can also make it much easier to keep track of your accounting going forward, especially when you’re ready to sell your note. Whether you decide to use a servicer or not, if you plan to make notes a business, then software might make more sense. If a homeowner requests an invoice, with per diem and reinstatement and payoff amounts, it can be printed with the software using built in templates, and it will look much more professional. Also, if you need to start any litigation, such as foreclosure action, or even to send a demand letter, the updated accounting can be sent over to counsel quickly, accurately, and in a professional format. A note holder may only be responsible for the accounting during his/her ownership, but keep in mind that we’re only as good as our data. Although I’ve never been challenged on our accounting, if you ever have any doubts with your accounting, you could just err on the side of the homeowner and lower some fees. While it may take more mind-power, another option is to create a formulated excel worksheet that you can then use to calculate all the accounting. Below is a snapshot of an excel worksheet that we’ve used for this purpose, although in this post it is showing only sample data. If you already have a formulated excel sheet created, it can be time-effective for accounting purposes, much like note accounting software is. But, it does not provide you with any professionally formatted templates to use when sending updated accounting to a homeowner, attorney, or note buyer. This last option is more on the time-consuming side and may be more prone to error if you’re managing a larger quantity of notes. On the other hand, it may be the most cost-effective option for someone, who’s confident in their accounting abilities and just starting out with a small number of notes. This involves using an online amortization schedule (such as the mortgage calculator at www.bankrate.com) to assist with manual calculations. When you’re looking at an amortization schedule from when that loan was started, you can use the next payment due date to find out exactly where you are now in the schedule. The UPB should match up with what is provided at that point in the schedule. You can calculate how many payments were missed and then calculate late fees with the percentage provided on the original note. The reinstatement amount is the missed payments plus late fees, or any corporate advances. Usually, the payoff amount would include the UPB plus the reinstatement amount. With manual calculations, you would have to calculate the interest each month with the updated UPB, and this is what can be the most time-consuming job to do manually instead of with software. Are there any note-specific challenges? Once you get some experience with note accounting, it’s really not that difficult, especially when it’s outsourced. Most first mortgages and home equity loan second mortgages are pretty straightforward. But, second mortgages that are HELOCS (Home Equity Lines of Credit) tend to be more challenging to calculate since most consist of a set margin (e.g. 2.75%) tied to a set index (e.g. the prime rate) that adjust, oftentimes monthly. When our HELOCS are nonperforming, it’s not that big of a deal since we typically redo them to a fixed rate payment plan. But, as you can see for many, this may be just one more reason to think about utilizing a servicer. And, how do I do my note accounting? In the beginning, I did do the accounting for my notes myself with an amortization schedule. But as we bought more notes and started to grow into a note business, we invest in the note accounting software. Although we still utilize note software today, our servicer does the largest percentage of our note accounting. So, maybe you’re just starting out in notes (as I was) and you’re doing the accounting manually for your first couple notes. But, depending on the types of notes and the volume of notes you’re managing, you may come to realize that the other options could suit you better. 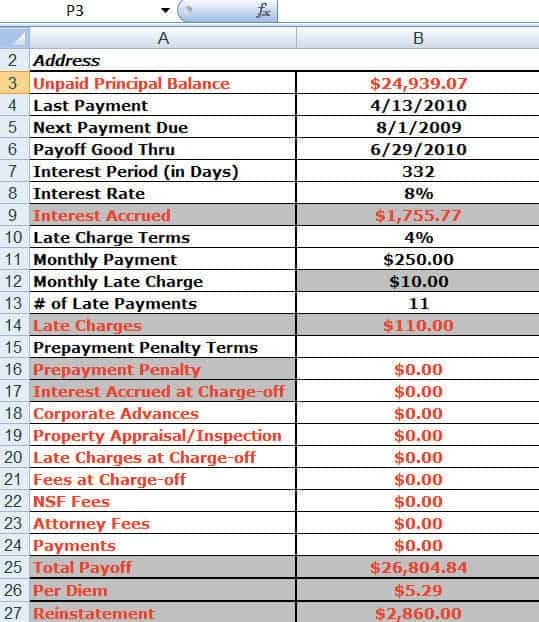 Is there any free software or apps out there that can help with tracking rents, expenses, etc.? There are none that I know of that I would recommend, other than excel. Such a great online pdf form filler tutorial blog post. I was working on filling out a form through PDFfiller; http://goo.gl/3aHZOj. It has a PDF search engine with wide array of fillable forms and some are Free. The edit toolbar is very easy to follow allowing highlights and line to be created as well. It might be of help Dave.